Regular consumption of sugar-laden fizzy drinks could ‘profoundly’ change the brain, experts fear. A study found that long-term consumption of a sweet drink led to hyperactivity and altered hundreds of proteins in the brain. Similar brain changes have been seen in illnesses from cancer to Alzheimer’s disease. The research was in rats but the Australian scientists said that it provides evidence that a sugary diet has consequences beyond our physical health. Researcher Jane Franklin said: ‘In most Westernised societies, there has been an alarming increase in the consumption of sugar-sweetened drinks. ‘For many adults, these drinks represent a substantial proportion of their daily calorific intake. ‘Our research suggests that the long-term consumption of sugar-sweetened drinks in place of water can cause long-lasting changes to behaviour and a profound change in the chemistry of the brain. The warning comes amid mounting concern about the health effects of the soft drinks enjoyed by millions of Britons every day. Heart attacks, diabetes, weight gain, brittle bones, pancreatic and prostate cancer, muscle weakness and paralysis have all been flagged up as potential problems. The latest study focuses on the brain, rather than the body. Ms Franklin, of Macquarie University in Sydney, compared rats that had drunk sugared water for a month with creatures provided with normal water. 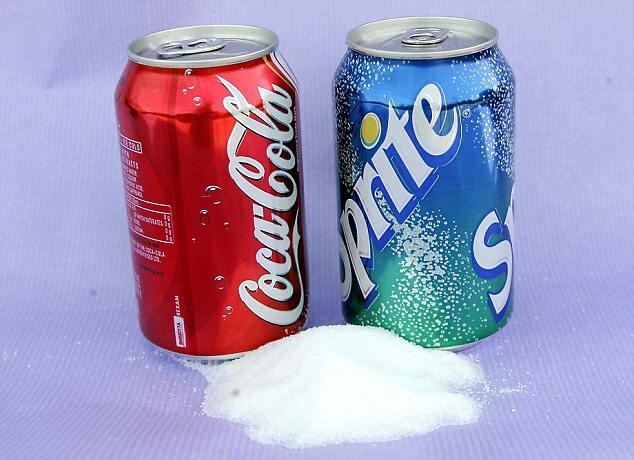 The sucrose sweetened water contained roughly the same concentration of sugar as soft drinks. The rats on the sugary water became hyperactive and examination of tissue taken from just one part of the brain showed changes in the levels of almost 300 different proteins. The researchers told the Society for Neuroscience’s annual conference: ‘There is a large body of research that has examined the implications of a high sucrose diet for cardiovascular health, obesity and the development of diabetes, however less is known about the consequences for mental health and the function of brain cells. Ms Franklin, a PhD student, said: ‘Soft drinks are a treat and should not be a staple food. ‘I think we can say that drinking too many soft drinks can affect brain chemistry, as well as your waistline. Earlier this summer, obesity experts accused the food industry of devising a ‘master plan’ to fool people – and governments – into believing sugar-laden fizzy drinks are healthier than they are. The European Congress on Obesity heard evidence that industry-funded studies were more likely to conclude that soft drinks did not have a major role in obesity – even though separate analysis of similar data found the opposite.